Pocillopora verrucosa (Ellis & Solander 1786) was originally de-scribed as a brooder although most subsequent work suggests that it is a broadcast spawner like all other Pocillopora described to date with the exception of P. damicornis (Baird et al. 2009). Although P. verrucosa colonies from Okinawa, Japan, have been observed to spawn in con- tainers supplied with un filtered water (Kinzie III 1993; Hirose et al. 2000) around the new moon in the early morning, the reproductive behaviour of the species has yet to be described in the field. 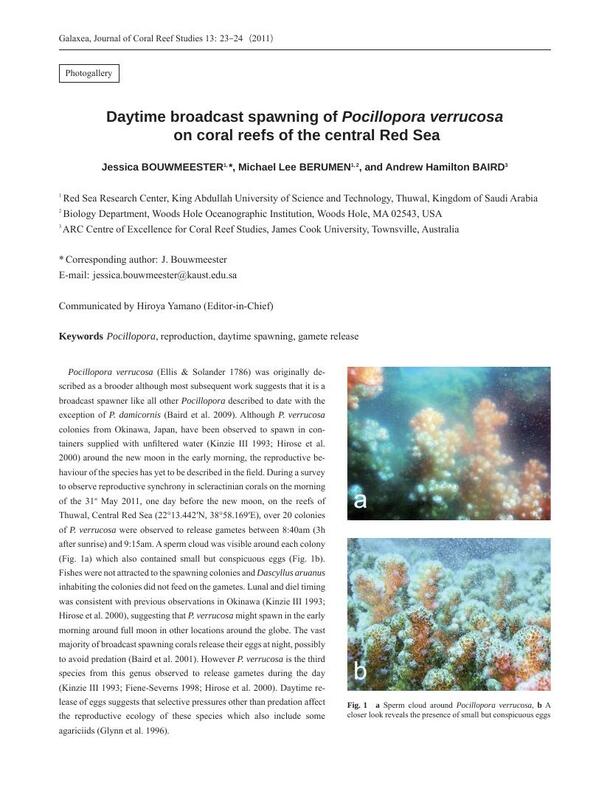 During a survey to observe reproductive synchrony in scleractinian corals on the morning of the 31st May 2011, one day before the new moon, on the reefs of Thuwal, Central RedSea (22°13.442′ N, 38°58.169′ E), over 20 colonies of P. verrucosa were observed to release gametes between 8:40am (3h after sunrise) and 9:15am. A sperm cloud was visible around each colony (Fig. 1a) which also contained small but conspicuous eggs (Fig. 1b). Fishes were not attracted to the spawning colonies and Dascyllus aruanus inhabiting the colonies did not feed on the gametes. Lunal and diel timing was consistent with previous observations in Okinawa (Kinzie III 1993; Hirose et al. 2000), suggesting that P. verrucosa might spawn in the early morning around full moon in other locations around the globe. The vast majority of broadcast spawning corals release their eggs at night, possibly to avoid predation (Baird et al. 2001). However P. verrucosa is the third species from this genus observed to release gametes during the day (Kinzie III 1993; Fiene-Severns 1998; Hirose et al. 2000). Daytime re- lease of eggs suggests that selective pressures other than predation affect the reproductive ecology of these species which also include some agariciids (Glynn et al. 1996).